"Please let my soul come to maturity before it is reaped." The protagonist in Victor Sjöström’s The Phantom Carriage finds himself caught up in a ghost story that forces him to reckon with his failures and broken promises as the year comes to a close. Typically, Christmas is the time of year for repentance and grace and all that life-affirming stuff that both Dickens and Capra associated with the season. Thematically, it probably makes more sense for all of this to occur during New Year’s, that time of the year when we resolve to become better people; at its core, this is what The Phantom Carriage is concerned with--the viral nature of our sins and the possibility of atonement, and it takes the form of a sinister film that preys on our metaphysical fears more so than our physical ones. In fact, protagonist David Holm (Sjöström) isn’t even alive for very long. He spends his last moments on earth in a graveyard with his drinking buddies, where he relays a folk tale that insists that the last person to die each year is doomed to drive death’s carriage for the next twelve months and become a reaper of souls. 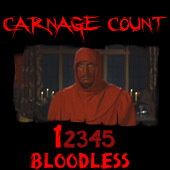 When he’s summoned by a Salvation Army girl dying of consumption, he refuses her call, and he’s accidentally killed in a struggle with his friends. He’s then horrified to discover that the old tale he just told is true, as he’s visited by the year’s current specter (Tore Svennberg), who takes him on a journey that forces him to revisit his wasted life as a self-destructive drunk. Like bleaker version of It’s a Wonderful Life, The Phantom Carriage is a horror film in the sense that it wallows in the misery of despair of not only Holm’s life, but also of those whose lives he scuttled on his way down. Instead of a snow-capped fairy tale that reveals all of the good his life brought to others, Holm is subjected to a dark, frigid excursion that gives forlorn faces to his sins. Specifically, he must face his wife, children, and Edit, the Salvation Army girl who took him in a year ago. Her tuberculosis is the direct result of having come into contact with Holm, who is one of the biggest, most unrepentant bastards you’ll ever meet. This story obviously has some Dickensian trappings and owes a lot to A Christmas Carol, but Scrooge seems downright quaint compared to this guy. Whereas both were essentially good guys who eventually went wrong once their vices (avarice and alcohol, respectively) sank their claws in, Holm is beyond rapscallion; had the film not presented an idyllic portrait of him prior to his drowning himself in booze, I’d say he’s almost beyond redemption. And he still might be, in fact; here’s a man who revels in spreading his disease to others and terrorizing his own family. One of the film’s more famous sequences sees him pounding through the kitchen door with an axe as his children cower in fear, a moment that was echoed by Kubrick several decades later in The Shining. While the image of a wild-eyed, deranged Jack Nicholson has since become iconic, this moment is no less effective, if only because David Holm seems like such a complete madman motivated by self-loathing and jealousy. Jack Torrance was driven to his madness by cabin fever and other-worldly forces, Holm is a wretched man who wants everyone to share in his misery. He lost everything, so why should anyone else have anything? He deserves this ghost story, which is a true bone-chiller, framed by a foreboding clock tower and askew cemetery crosses. Before it’s ever time to tell the tale, we’re draped in the ambiance for a campfire tale on a cold winter’s night. Once the story’s delivered, we’re confronted with a horrifying, purgatorial fate; it isn’t enough that one might die on New Year’s Eve, but they might also be doomed to wander the earth in service of Death itself. We’re told that one night for Death is equal to a hundred mortal years, a frightening prospect that exploits the agony of the soul rather than the flesh. There is certainly something that is upsetting about being reduced to a mere shade, even if Holm probably deserves this fate (or possibly one that’s even worse). Sjöström gives this film the appropriate visual identity of a horror film; drenched in deep, ethereal nighttime blues that contrast with the warm, hearth-like interiors, The Phantom Carriage broods with a remarkably spectral intensity. At the center of it is Death itself, the lone passenger of the phantasmal carriage. Realized with a double exposure technique that seems crude today, this was a remarkable feat for 1921; this was still well before optical printing was a possibility, so the technical precision involved in realizing the ghastly effects was significant. Death winding down a moonlit road is the film’s enduring image, but the scenes that have him literally pulling souls from dead bodies is particularly haunting; I love the literalism of these moments--here is death, a reaper who collects souls, hauling and flinging them around as if they were still carcasses. One doesn’t gather a sense of pride, but rather, an inevitability to this task, which is precisely why it should be avoided. That sense of inevitability hovers over The Phantom Carriage, which feels like an impressively mounted funeral procession for most of its running time. The opening and chapter titles are accompanied by an ominous knocking sound that evokes the solemnity of an undertaker crafting a coffin. Somewhere along the way, though, The Phantom Carriage deviates from this path, opting instead for one that’s lined with the blooms of salvation. I think the ending is a bit of a tough sale considering how thoroughly despicable Holm is, and, in some ways, this feels like one of those Production Code era Hollywood films that wedges in a moralizing happy ending that maybe isn’t earned. Still, this hardly undercuts the brilliance of the film’s stunning visuals and unique narrative structure. Relayed through a succession of flashbacks within flashbacks, it may feel a bit clunky by modern standards, but it was innovative for its day. If anything, this journey’s path is hardly straight, as it instead winds and wends, allowing the narrative to strive on visuals. Said visuals are the film’s strength, and Sjöström plays to them wonderfully. The image of death was so enduring to Ingmar Bergman that it inspired his own use of the character in The Seventh Seal, a fact that has contributed to the film’s fame. 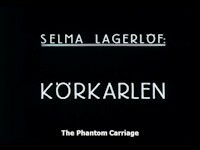 I suspect that The Phantom Carriage didn’t really need Bergman’s help--it is quite masterful, if not a bit uneven when it eventually cops out. It’s a primal horror film that surrounds you with atmosphere and draws you in with a wicked hook; once it settles on revealing the indignities of Holm’s life, it becomes both terrifying and heartbreaking; Sjöström hardly seems indignant, though, as he instead insists on grace as a possibility. In many ways, this is the ultimate New Year’s film, one that reminds us that it’s never too late to make a resolution. Despite being highly regarded for decades, The Phantom Carriage only recently made it to DVD in some regions; Tartan (whose disc I watched) released it a few years back, where it’s accompanied by a new, decidedly modern score by KTL. Though their score clangs with contemporary industrial sounds, it makes for a fine companion, as there’s a droning eeriness that matches up with Sjöström’s funereal imagery. Fans who haven’t been able to check this one out in Region 1 can now grab the Criterion DVD or Blu-ray; both some with some supplements, including a commentary from film historian Casper Tybjerg. As a landmark film, The Phantom Carriage warrants inclusion on any film lover’s shelf; both scary and sad, it’s a fascinating cinematic take on holiday-induced deliverance from sin and regret. Buy it!